It is paradoxical, but despite the importance attached by Belarusian historians to the figure of Francysk Skaryna, doctor of arts and medicine, pioneer of Slavic printing in the times of Renaissance, his name is almost totally unknown to the world historiography (except the newest studies of the Czech and Lithuanian historians, as well as the older generation of Belarussian emigration who greatly contributed to the Skaryna Studies). Unfortunately, there is nothing surprising in this lack of special studies devoted to Francysk Skaryna. Such lacuna is the consequence of the almost total indifference of the historians towards the history of Belarus in general (besides, of course, contemporary and burning subjects, such as socio-political perspectives of the “last dictatorship in Europe”, studies of the Holocaust and the guerrilla movement in the Second World War, or the Vitebsk School of Art as the cradle of Marc Chagall’s art). While the discussion of the reasons of such “lack of interest” in the history of Belarus (medieval or early modern history), are practically unknown is not part of my goals (although it can be useful), I would simply highlight the gaps in Skaryna studies, which is even more obvious taking into account the importance of Skaryna’s image for the Belarusians themselves. In the context of the celebrations of the 500th jubilee of printing in Belarus this year, Francysk Skaryna is not only a peculiar case, but it is a symbol, a kind of dynamic cursor of the historical consciousness of Belarus today in general. At the same time, in Belorussia itself, despite the fact that Skaryna’s Studies count more than 6,000 publications, they are often limited by strictly academic circles and therefore are inaccessible to the public. In addition, geographical and disciplinary boundaries and stereotypes do not contribute to the spread of knowledge. Thus, in this context, the project of SkarynaLab/ Laboratory for Research on Francysk Skaryna and Valorization of the Belarusian Studies was born. 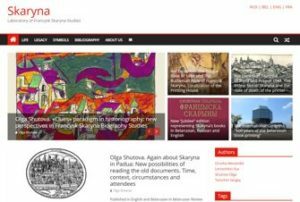 SkarynaLab, https://skaryna.com/en/ is set up, providing a unique platform to coordinate our research: scientific bibliography, historiography, classical publications and the most recent. Belarussists of the world, unite!